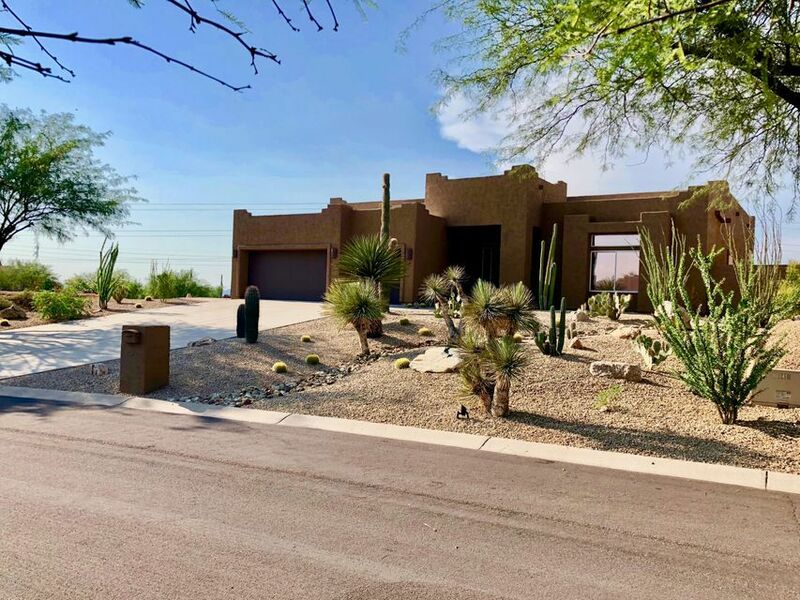 Wonderful Troon North Scottsdale home in an ideal location with endless views of NAOS, Desert Mountain, Black Mountain, Elephant Butte, Tabletop, and to the south are views of beautiful Pinnacle Peak and Troon Mountain! Extensively and tastefully upgraded with granite and natural stone surfaces in Kitchen and Baths. New 6'' baseboards, engineered wood flooring throughout, unique fans in every room, painted inside and out, faucets, etc. The Master Bath has a beautiful Travertine shower that goes to the ceiling and a Jacuzzi tub w/jets to give you that spa feeling! Front and backyards have been revised and landscaped to create the southwest-feeling complete with it's own Saguaro! Relax by the pool with rock water feature and take in the FABULOUS views, peace and serenity!